Sleeping Giant. Impending Doom. For All Eternity. War Of Ages. Overcome. Those Who Fear. Your Memorial. 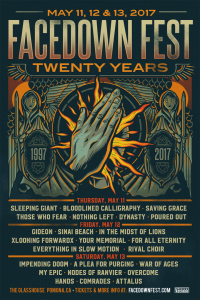 All of those bands will be helping Facedown Records celebrate 20 years at Facedown Fest on May 11th, 12th, and 13th, and that is less than 1/3 of the lineup.